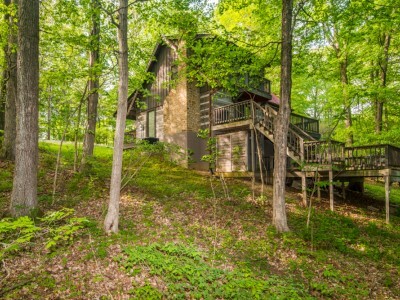 This rustic yet modern Brown County style 2 story log cabin offers guests plenty of privacy and plenty to do. A wonderful place for a family vacation or romantic weekend getaway. The cabin has a covered front porch, equipped with old-fashioned rocking chairs and a Medford oak porch swing. The log great room features a stone fireplace with a gas log stove, a complete kitchen and dining area. You will find a romantic master bedroom with a Sassafras queen sized bed and a second bedroom with a queen sized bed. As you descend downstairs into our third level you will find a game room with a oak game table and chairs, lots of board games, new pool table and a Big Screen TV with 150+ TV channels on satellite plus a DVD and lots of movies. Step out the back door on to the multi-leveled deck overlooking the Brown County hills. The deck is equipped with a large patio table with umbrella, chairs, BBQ grill, and a large 6 person covered hot tub. It's a wonderful place for relaxing after a full day of exploring Brown County Indiana. Enjoy all Brown County Indiana has to offer, hiking, biking or horseback riding in Brown County State Park, or, tour the art galleries and quaintshops in Nashville, Indiana.